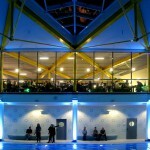 Cologne’s new ice and swim stadium Lentpark accommodates two ice rinks, an indoor swim centre with a variety of pools, a sauna, an outdoor natural water swimming pond and a restaurant. 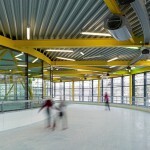 An elevated ice skating track, unprecedented in Europe, runs as a round circuit through every part of the building providing exciting views inside and outside. 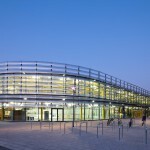 An intelligent cross-linking of the building services allows for the seemingly contradictory climatic requirements of an ice and swimming facility to operate in an energy efficient manner, making it the first ice sports facility in the European Union’s Green Building Program. The principal design concept of the stadium is a completely transparent triangular form which unites the different parts of the building in both a functional and aesthetic fashion. 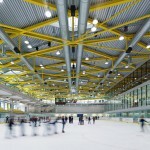 On the north-west side lies the 1,800 square meter ice rink. 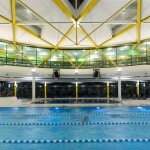 On the south-east side the lap pool and recreational pools can be found. The entrance hall is centrally located and functions to divide the buildings main elements: water and ice. All areas combine a gross floor area of 12000 square meters. 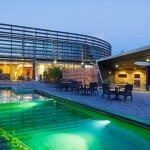 The park-like landscaped outdoor area offers a natural water pool as well as a relaxation area. 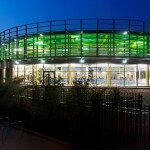 Schulitz incorporates innovative solutions for the energy and water supply in the facility. Contradictory needs of hot and cold elements are united by cross-linking the building services and thereby minimizing operational costs. 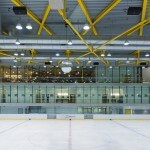 Thus the waste heat from the ice rink’s cooling devices is used for heating water. An on-site well provides water for the swimming pools, the sanitary facilities and the ice preparation. The roof is equipped with a vast solar power system. Economical aspects were taken into consideration while planning the roof structure; the modular building method aligned with prefabrication kept building costs low.